Here's a quick look at three successive solar returns for Bitcoin. 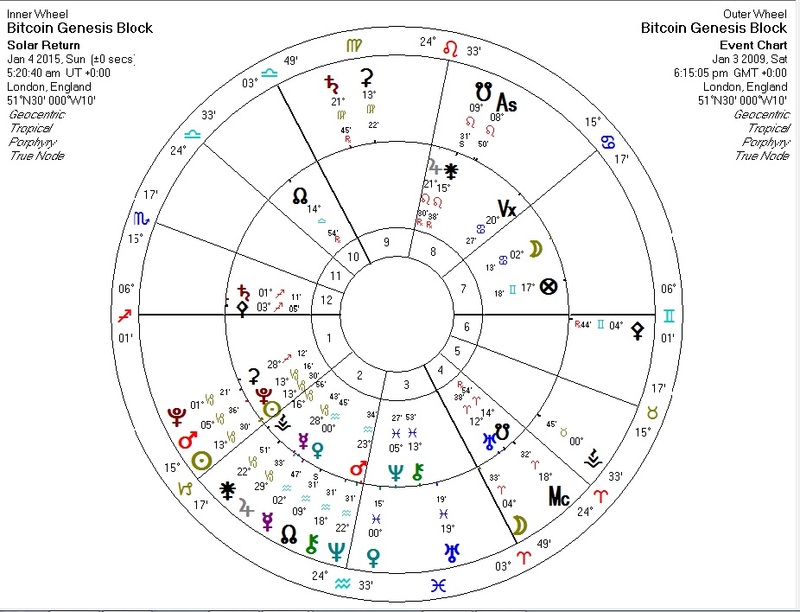 Because Bitcoin's "birthday" is so close to January 1, the solar return chart is an interesting way to start guessing about how well Bitcoin will do for the calendar year. While I always do solar returns for clients, it somehow skipped my mind to look at them for Bitcoin. This was a mistake: the solar returns for Bitcoin have been very descriptive of their associated years. The fiery Sun rules the Ascendant and the Second House of value and is supercharged by the Uranus-Pluto square. Uranus, representing breakthrough, is at the Midheaven representing public prominence. Venus quincunx the South Node and Neptune conjunct Bitcoin's Venus did little to slow it down. While the North Node is in the Second House suggesting that seeds are planted for later growth, Saturn is also there to hold it down. Venus is quindecile the South Node, draining life out of the valuation. 2015: Revenge of the Bitcoin? The Sun and Pluto are at the Second House cusp this year, and Venus is at home in that house (abeit semisquare Chiron which has tended to be an annoyance to the price). Saturn, ruling that house, is at the Ascendant. The North Node is in the Tenth House of achievement and Jupiter (ruling the Ascendant) is at the cusp of the Ninth House of publicity. 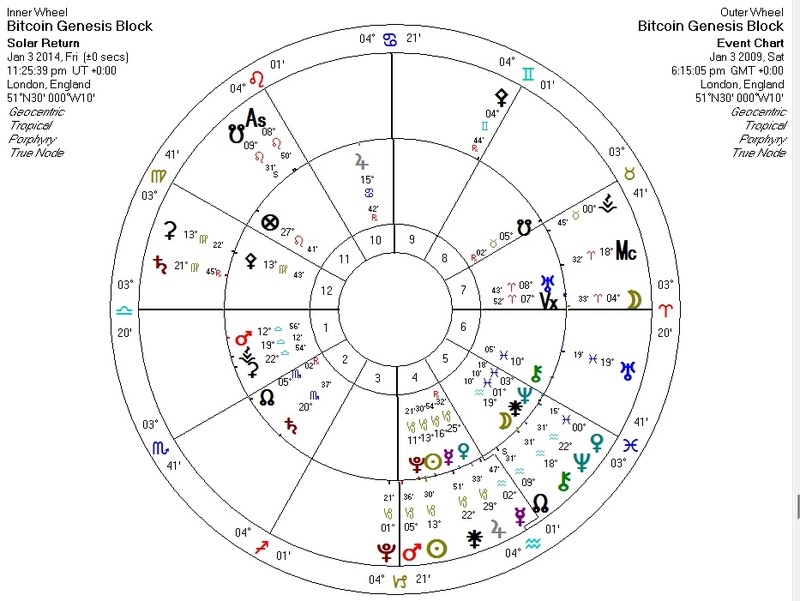 Venus on the return chart is conjunct Bitcoin's natal Jupiter, which seems to promise positive things. Then again, Uranus, ruling Venus, is conjunct the South Node. We have some mixed signals. I suspect we'll see more of the up-and-down of 2013 this year and less of the straight-and-down of 2014. 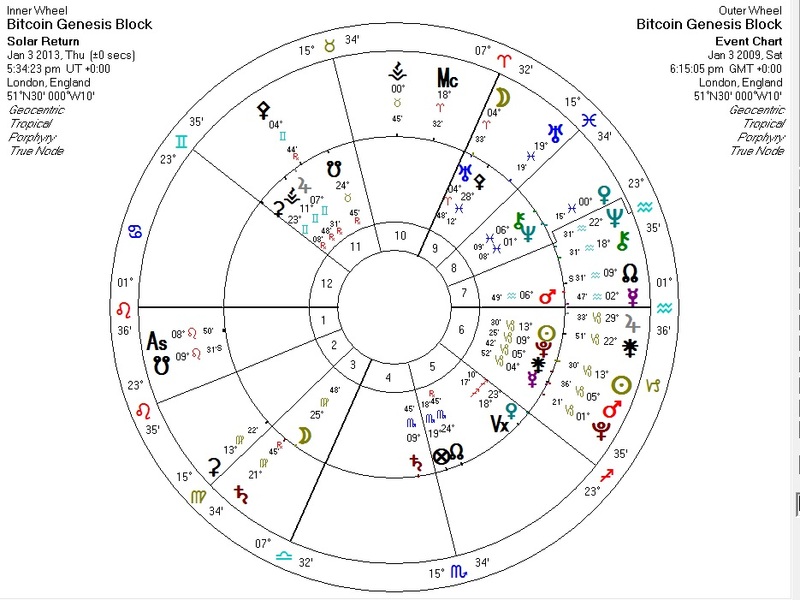 This is the last year of exact Pluto transits to Bitcoin's Sun. If Bitcoin survives the year, it may be here to stay for a while.